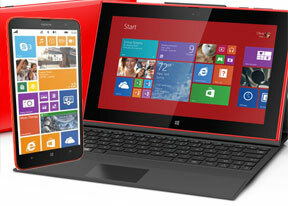 Nokia Lumia 2520 is company's first tablet. It comes with a 10.1" IPS ClearBlack 1080p display and is powered by Qualcomm's latest Snapdragon 800 chipset. Naturally, as the slate utilizes ARM cores, it is running on the ARM-compatible Windows RT 8.1 OS. The Lumia 2520 looks a lot like a stretched Lumia 800. It is made entirely of polycarbonate, its edges are rounded, and it even comes with similar silver glossy controls (Lock key and volume rocker) on the top. The front of the Nokia Lumia 2520 is dominated by the 10.1-inch IPS ClearBlack 1080p display. It has excellent image quality - easily in the running for best tablet screen out there. A huge piece of Corning Gorilla Glass 2 protects the screen from scratches and cracks. There are two stereo speakers placed at the far bottom and barely visible. There are also a 2MP snapper above the screen for video chats and the mandatory capacitive Start key centered below the 10.1" display. The secondary microphone for active noise cancellation is at the back, very close to the 6.7MP rear ZEISS camera. As we mentioned above, the top of the Lumia 2520 houses the glossy Power/Lock key and the volume rocker. The microSIM and microSD card slots are also around, but you'll need the ejection tool to access both of them. The bottom of the Lumia 2520 has the proprietary connector for the keyboard dock and the primary microphone. The right side of the Lumia 2520 has the 2.5mm charging port and the 3.5mm audio jack, while the left one packs the microUSB 3.0 and HDMI ports. The Lumia 2520 is running on the latest Windows RT 8.1, and comes with Microsoft Office and free offline navigation thanks to HERE maps and services pre-installed. Those are two very helpful services and are bound to give it an edge over many of its rivals out there. Nokia Lumia 2520 will be available in glossy red and white flavors, as well as in matte cyan and black models by the end of this year. An optional keyboard dock with an included battery, which will double as a screen cover will also become available alongside the slate at launch. We also got a presentation of the Lumia 2520 on video. The first one focuses on the hardware and software of the device – the bright screen, slender Lumia design, plenty of standard connectors (including microUSB 3.0), plus exclusive Nokia software (Story teller, Nokia Camera, Video director). The second covers the keyboard dock, which is quite different than the one the Surface has – the Nokia dock completely covers the device's front and back, but leaves ports accessible. It also adds two microUSB ports of its own and a battery.